The Matildas are receiving immense global support on social media following their decision to boycott next week’s US tour amidst unresolved CBA negotiations with the FFA. After the FFA rejected their requests for improved working conditions the Matildas are making their voices heard and people from all over the world are listening. Irish international women’s football correspondent Rachael Stack is supporting the Matildas through this tough time, and said the outpouring of support is indicative of women’s football fans’ relentless pursuit of increased respect for female players. “There is no divide between us and them in comparison to money… There is more interaction between players and fans, almost a bond,” Stack said. Stack hoped an agreement could be reached between the Matildas and the FFA, as boycotting near-sellout games against the world champions is a step backwards for players involved and for women’s football in general. However she concedes this bold move could have positive ramifications if it exposes the real issues and pushes more people to realise that at this point, the women’s game may not be sustainable if it’s dependent on current resource allocations. “We need to continue to use social media in order to break down barriers,” Stack said. US based football fan Cheryl Gregory has followed the Matildas since 2009 and is not disappointed about the US tour’s cancellation as she can see the bigger picture. “I am thrilled that the Matildas have been savvy enough to garner worldwide attention by choosing to stop working at such a critical period of heightened international attention on the women’s game, following the US championship at the World Cup,” Gregory said. Gregory believes women’s international football has reached a historically significant point and cites the advancements and accessibility of new media as fundamental elements in this journey. “We are all connected now and I can use my tiny individual voice to share the spotlight so that others can become aware and speak out as well,” Gregory said. As post-World Cup momentum continues, the Matildas’ battle is undoubtedly strengthening the player-public alliance and is a precursor for bigger things to come in women’s football. 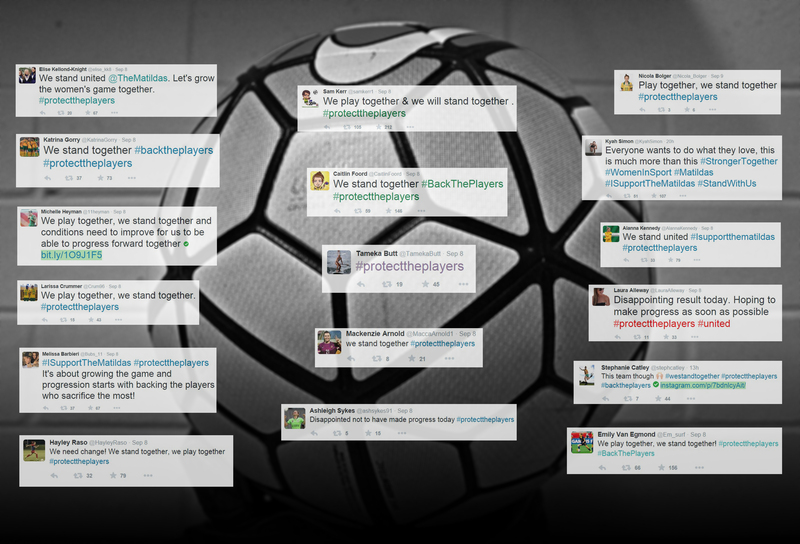 Click here to view a tweet collection which offers an extended glimpse into the support for the Matildas.